I met a patient during her follow up. She was doing well after her coronary stenting and was free from chest pains. She has started gardening and recently enrolled for dancing classes. I was happy for her. Just before leaving the room, she turned and asked the question most single doctors dread… “Are you still single? ”. “I have a niece I want you to meet. She is beautiful, intelligent and well mannered. She will take good care of you. She read law in England. We have had quite a few proposals. But I told my brother you are the best person for her. Shall I speak to your parents? Do you have your horoscope with you now?” she blurted out in a single breath. I have faced this before. And I am always prepared. I told her I was very flattered to be considered but I was too busy working in cardiology that marriage is something for me when I am more settled in life. “Don’t wait too long. My niece will not remain young forever. And neither will you”. 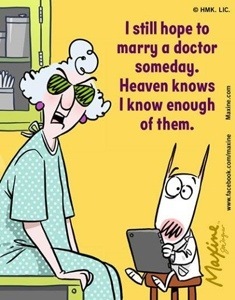 Single doctors are a common breed. Not exotic. But common. We live among you (the rest of the world), and as much as we can, we don’t want to attract attention. But we fail. Miserably. Let me tell you all that I have heard and witnessed. The good, the bad and the ridiculous. It’s true the way doctors care for the welfare of others can at times supersede other professions. This law is not inviolate. Caring for another person is an inherent character. It’s also something you need to build and work on. It also depends a lot on how you were raised. You don’t necessarily have to be a doctor to learn to care and be sensitive to the needs of others. The profession comes with an unavoidable responsibility to care but the onus falls on the doctor to reciprocate in kind. And not all doctors do. There are some who have been numbed by the profession that they don’t care anymore. Death and suffering becomes a routine. So do they now make bad husbands or wives? Obviously not. It just a way they react to the demands of the profession. And if you want someone to come home in the evening after losing a patient who bled to death on the operating table and ask about how your day was and if the dog has had its bowel movement, you are married to the wrong person. If based solely on a financial point of view I don’t think this is entirely true. Doctors earn a decent income and unless you are in the private practice, the sum is modest at best. Inflation and lifestyle expenditure within the upper middle class bracket doesn’t help either. Marry an investment banker. Now that’s a real ’good investment’. The profession comes with endless responsibilities. And no illness comes with an appointment. For the doctors, the job isn’t ’eight to five’. And having a person to attend to your needs at the end of an exhausting day is a blessing. But many doctors I know become complacent. They take the sacrifices of their spouses for granted. It is in no part helped by the fact that in certain societies the burden of the household falls solely on the spouse who is married to a doctor because the doctor is assumed to be always busy. Not a very fair deal of you ask me. Let me give you a short preview of the not too distant future. Doctors aren’t a rarity like they once were. Due to the incessant mushrooming of medical schools, let me paraphrase AirAsia’s famous slogan… “Now everyone can become a doctor”. So get that silly idea out of your (or your parent’s) head. True. Unless you give us a reason not to be. Just like the rest of the human species we are prone to tantrums, labile emotions and rantings. We become less well mannered and irritable when people try to challenge our years of medical education with snippets they got from the internet last night while smearing night creams on their puffy porcelain faces. Beware. We are not as nice as we are made to seem. I came across a saying recently, “When you are dead, you don’t know that you are dead. It is only difficult for the others. It is the same when you are stupid”. That’s sums up what I think of people who make these statements. Some of the best mothers and wives I know happen to be doctors. It’s not about the profession as I have mentioned before. You have to work on being a good mother or a wife regardless of what you do. It comes easier for some who are born with certain innate abilities and for others you need to work just a little bit harder. Doctor or not, you need to learn to live a life balanced between work and home. Profound thoughts…what else can we expect from you!… Whatever said and done , most importantly I think it would still be nice to know that eventually all the ‘single” ,dedicated and inspiring doctors too are able to meet their ideal matches and move on to their next phase of life happily…. well, I suppose for some it is just a matter of time.Thanks for sharing your thoughts and help remind us that it is not wrong to b still SINGLE !!! Thanks!!! Very well said indeed.. next time anyone tells me this single doctor thing.. I’ll ask them to read ur blog.. especially all the aunties and the brokers with horoscopes!! !